Rush, rush, rush. It began with a text followed by another text and another last night. Breaking news. The Today programme then Good Morning Wales. I understand it is beyond their control and that David Davies’s resignation was unexpected, as was the death of that poor woman. And I know it is petty but my plans go awry. It is better that I don’t make them, perhaps? Just let life be. Here it is, throw it to the wind and see what happens. Nevertheless it is almost all done, but no time to sit and stare. The Chinese grandfather was out again this morning as we rushed to the supermarket. Staring at plants this time. A meditation? I love their quietness. A cultural thing, I think. It was a gentle morning, only a few kids outside the Why Not? club chanting, John, John, John. Who or what John was God only knows? I listened to Philip Treacy on DID yesterday. Such a gentle being. I loved his statement about wanting to sew as a child, grabbing moments at his mother’s sewing machine when she went out to feed the pigs. 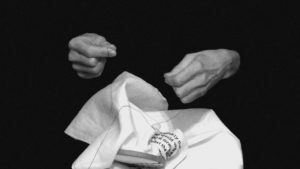 And more about sewing, or hands to be more specific in Sennet’s The Craftsman. He writes about monotonous tasks and about their process in our learning finesse. It’s about rhythm, he states. Yes, that is it. I want to deconstruct it. Why do I want to sew? What is the calmness it induces? Monotony, no, familiarity, yes. Treacy talked about the pleasure of joining two pieces of material together. For me it is the in-out, the flow of the hand. Always. Time. I clutch at it. He is calmer today. I hold him. I hold him fast. It will be alright my love. I promise. This entry was posted in Writings on July 9, 2018 by Ellen Bell.